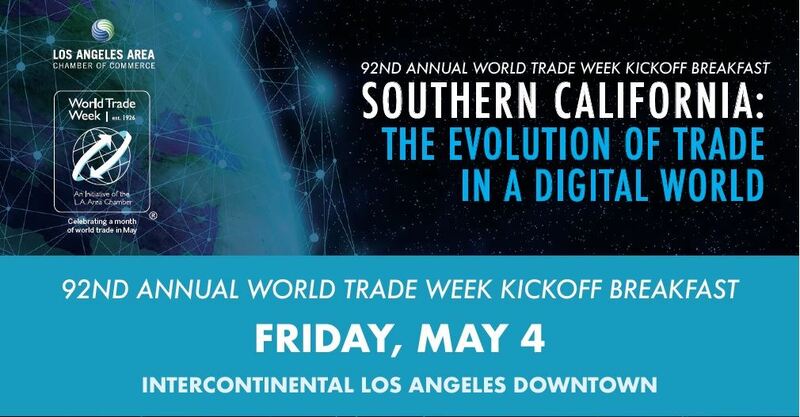 For over 90 years, World Trade Week (WTW), an initiative of the L.A. Area Chamber, has been the most extensive and unique program of its kind in the country. Join World Trade Week for the largest celebration of international trade in the nation at the 92nd Annual World Trade Week Kickoff Breakfast. WTW dedicates itself to educating the public on the importance and benefits of global trade on the local and national economy through a series of educational programs and events. World Trade is celebrated throughout the month of May with more than 30 events hosted by partnering organizations in Southern California that are jump started by the Chamber's Annual WTW Kickoff Breakfast with more than 1000 guests. World Trade Week supports college and high school scholarships, high school student workshops, as well as briefings for civic and business leaders interested in benefiting from the global economy.